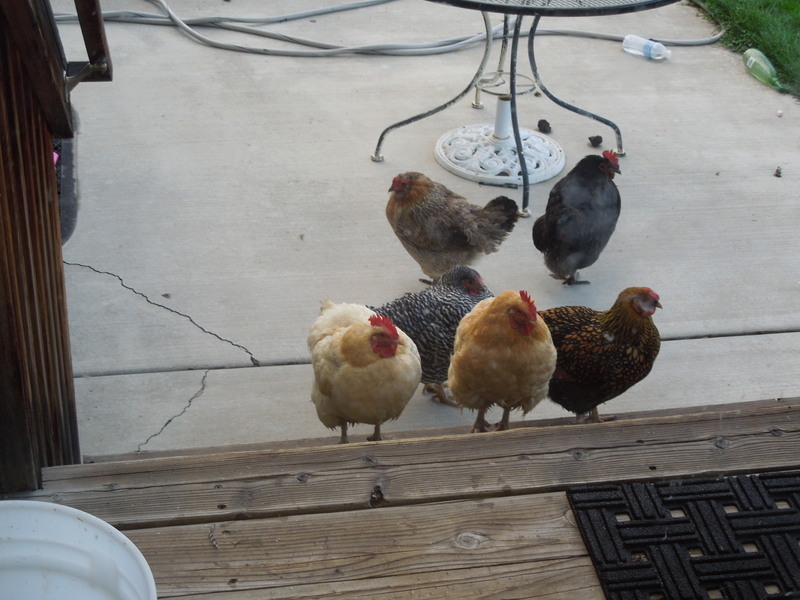 I looked out the kitchen window to see some visitors on the back porch. Are they stalking me? Or just getting closer to see what the humans in the human house are doing, and when is that lady with the blonde feathers going to come out and bring them some more food? Fall Harvest. It’s not much of a ‘bounty’ around here. 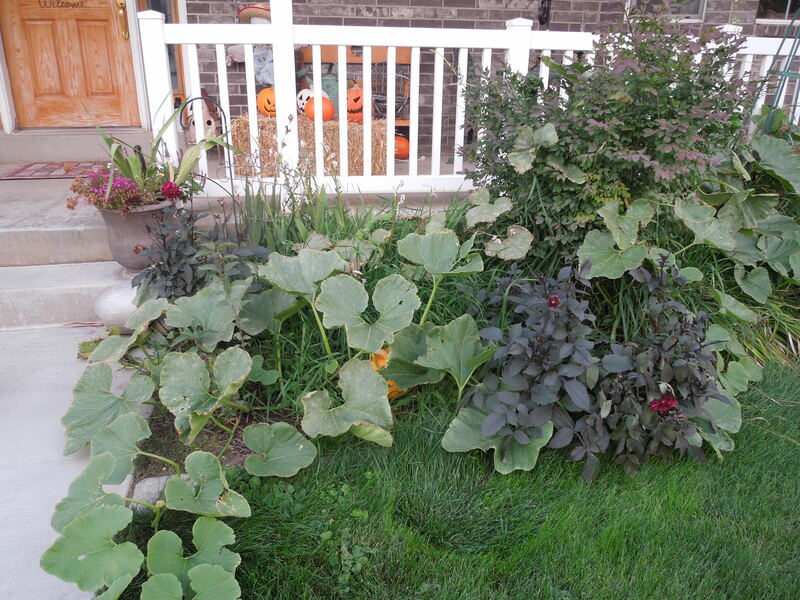 Sadly, we let our garden just go crazy with no pruning or cutting back, and the squash and tomotoes are sprawling all over the place. Even the ones I caged have tipped over their cages. 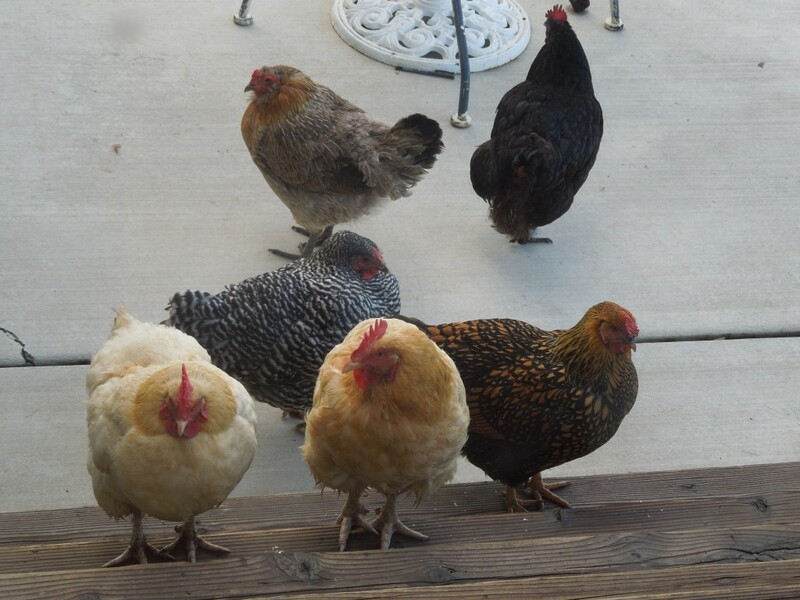 We had to put a little fence around the garden to keep the chickens out, but they have learned they can fly over that little fence or worm in around the gate, and many of my tomatoes are beak picked. Because I have heard it will be cold later this week, we went out and picked all the tomatoes we could find that were at all ripe. Seriously, what is with the ripening (or lack therof?) Most of my tomatoes are green, and the ones that have color are mostly orange. 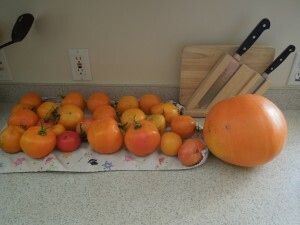 I picked the orange ones and brought them in to ripen. I can hope. 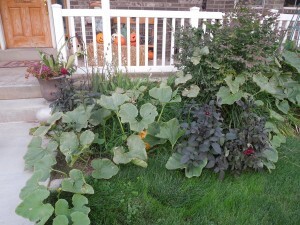 I also picked a couple of butternut squash, but left some others out there to grow some more. Don’t want to pick them too early. I have ONE tiny pumpkin among the leaves, and since it was orange, we picked it and brought it in. Can you tell which one is the pumpkin? 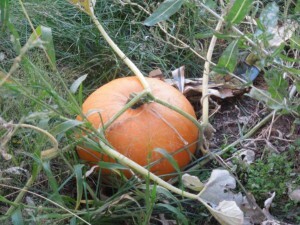 I have another place where I planted a pumpkin seed, and in the whole sprawl, I think there is one pumpkin there, too. 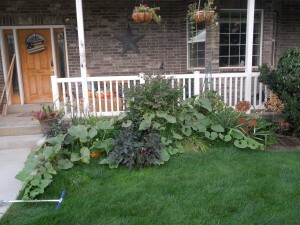 Then, in my front flower beds, we see this. 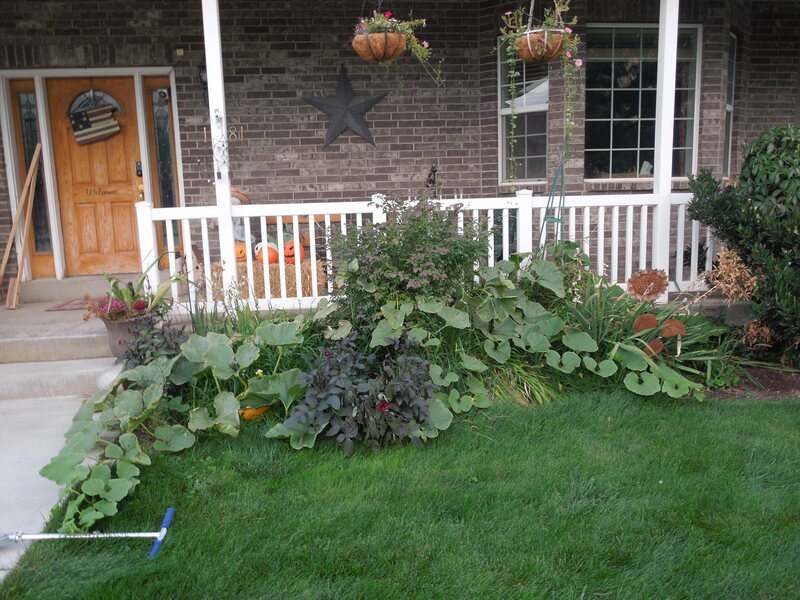 If you look closely, you can see our biggest pumpkins of the harvest. And this from a volunteer plant. 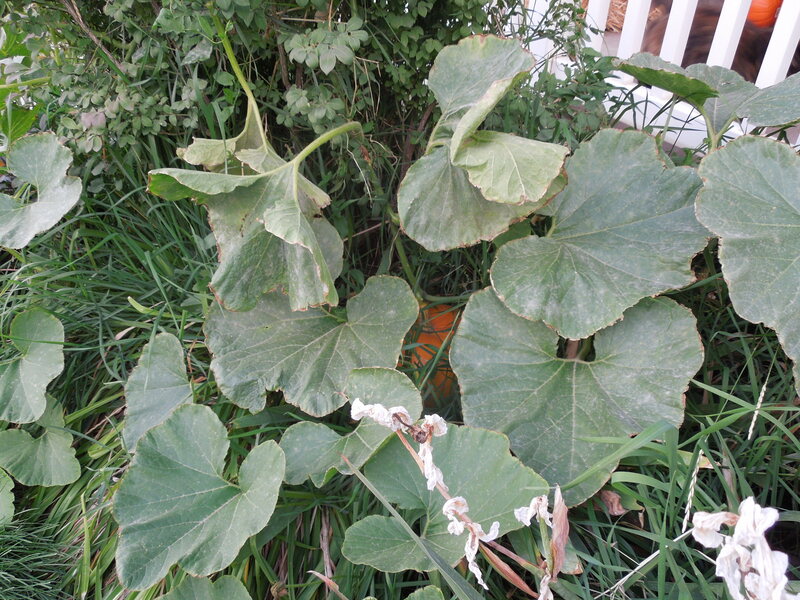 At the end of Halloween last year, I chucked an old gross pumpkin off the porch into the flower bed, and it’s decided to grow and produce pumpkins for us. 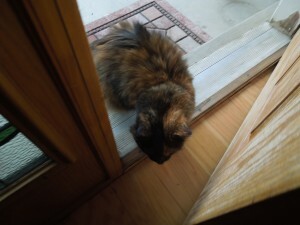 Oh, and here’s my little outside visitor, hoping to someday be let inside. Really, kitty? You’ve lived here for a whole year now, and in that time has anyone let you in? Sorry. If you wanted to come inside, you should have latched on to a family without allergies. 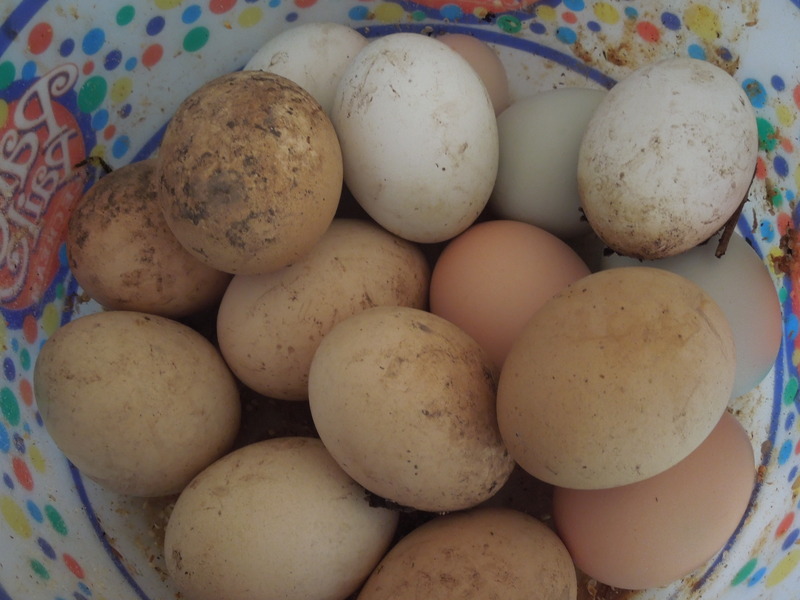 Yesterday we did find the hidden stash of eggs from the chickens, though. I had been wondering why they were only laying 5-6 a day, when all 11 of them should be laying at least every other day, now. They had a secret next, silly girls. Yes, most of those were pretty dirty, but still good eggs. I made a big batch of brownies and used MOST of them in that, just to use them up quickly. So, no, we’re not self sufficient and living off of what we grow, but we at least try. There’s a lot of terrible crap going on in the world, I do not deny it. This week we have horrific flooding and a shooting in our nation’s capital. BUT, there are also amazing people everywhere you look. People who are trying to do their best to make things a bit better. I saw this 3 minute commercial and cried, I was so touched by the sweetness of the message. I just read a book for Book Club called Zeitoun. 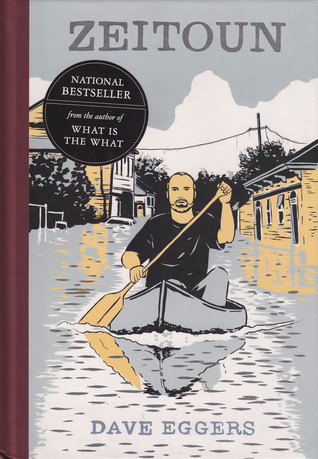 This tells the true story of the Zeitoun family and their experiences during Hurricane Katrina and its aftermath. I learned a lot about what really went on after this terrible disaster, and loved reading about the many large and small acts of service that Zeitoun performs. As I was reading this, I would see on the news the flooding that is happening in Colorado right now, and the similarities were just too uncanny. I am sure there are many many miracles and amazing stories of people helping each other. Just today I saw a facebook post about how local Coloradoans could help, by going to the command center and donating food, snacks, and even just saying thank you to the National Guard and others who were working there. In the Relief Society Session of General Conference in April of 1995, President Gordon B. Hinckley reminded us..
“Each of us can do a little better than we have been doing. We can be a little more kind. We can be a little more merciful. We can be a little more forgiving. We can put behind us our weaknesses of the past, and go forth with new energy and increased resolution to improve the world about us, in our homes, in our places of employment, in our social activities. When I see my neighbors and the things that they are doing, I am amazed. One of my neighbors put up 65 quarts of peaches. She also bakes like a mad woman, and is ALWAYS giving away her tasty treats. 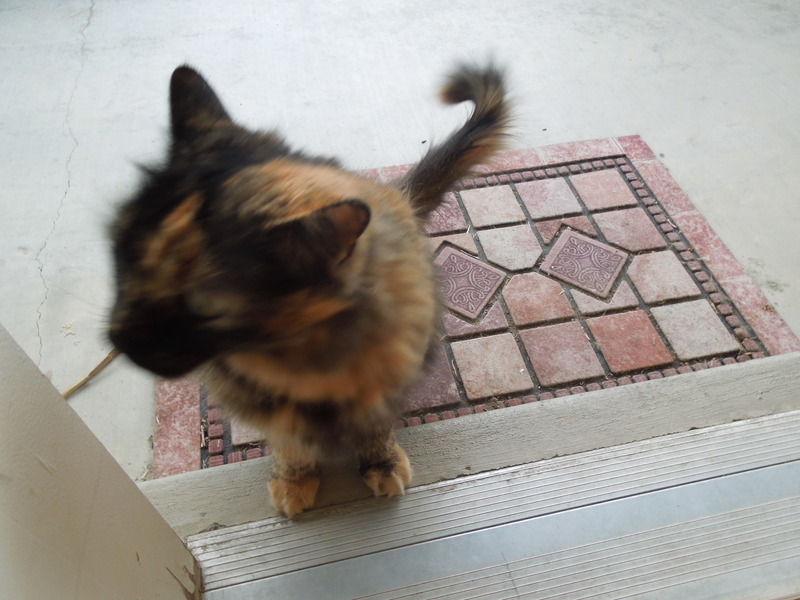 We have been the recipient of her baked goods more than once, and we are always appreciative. She is amazing. Another friend is valiantly holding her household together while doing all she can to ease her husband’s suffering. She is doing her best to keep things as normal as possible, even though she has to take her husband to chemo and other doctor’s appointments, and she has to be the strong one in the family. She is amazing. I see this friend’s visiting teachers faithfully bring chemo day meals in to this family, and many other helping with yard work, treats, and anything they can think of to do to help ease their suffering. They are amazing. There are two sweet ladies in my neighborhood who have recently taken up biking, and just completed their first 70 mile bike race. They call themselves the bikin’ grandmas. Amazing. Four friends from our bell choir just ran a half marathon. One just ran her 4th (or maybe it’s more) marathon. They amaze me. I see people volunteer at school, spending hours making sure their programs run smoothly. 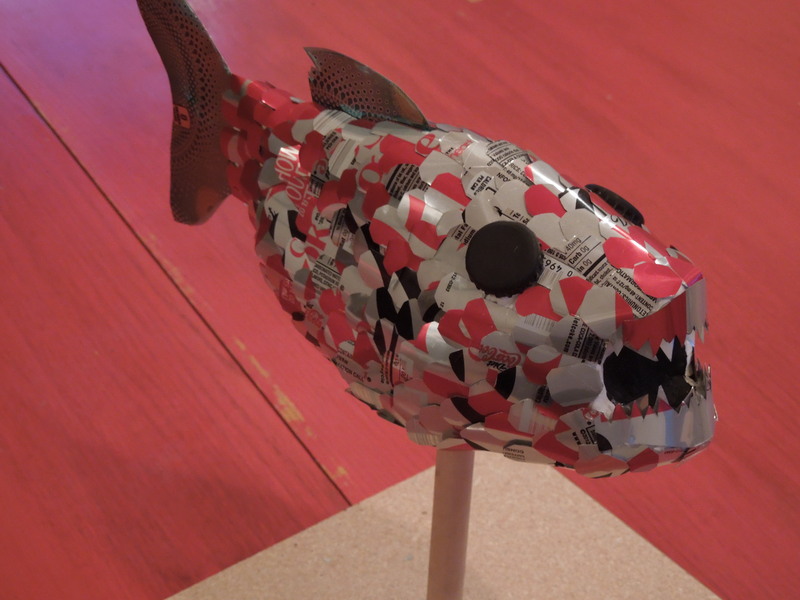 They may not be publicly recognized for their work, but they are amazing. Everywhere you look, you will see ordinary people doing amazing things. They really are trying a little harder to be a little better, and they are accomplishing wonderful things. I’m sure if you give it some thought, you will see that YOU are amazing too. 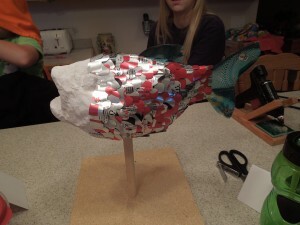 Another of Megan’s projects is done (Whew!) and that means I can reclaim my kitchen counter again, at least for a day or two. 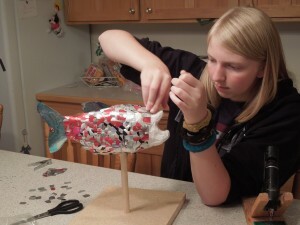 She’s been working on this FISH thing. I don’t know if Ryan suggested this one to her, too, or if it was her idea at first. 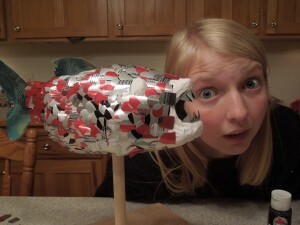 It’s another project for her AP 3d art class. 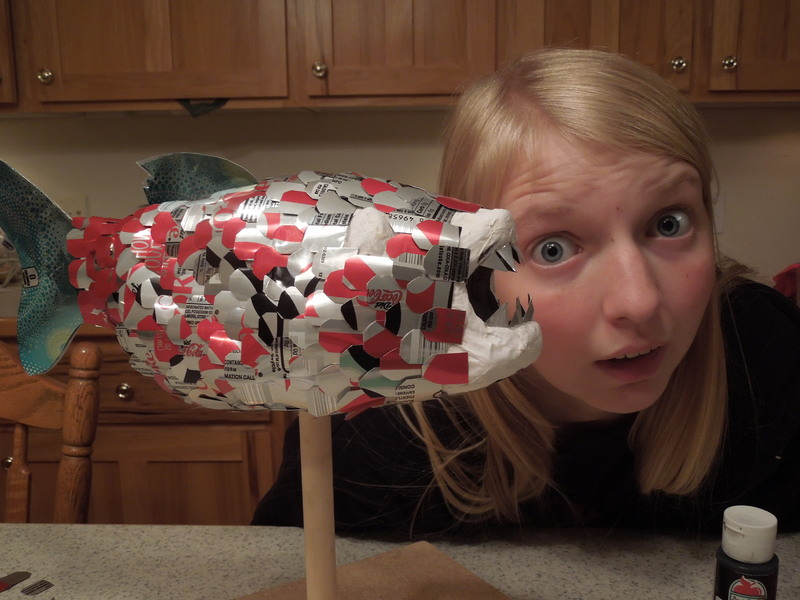 First she had to paper mache’, then it was cutting up a dozen soda cans, and then the endless gluing, gluing, gluing. Can you see the little notes she left that say, “Work in progress”. Warning me to not clean her project away. Um, whose kitchen do you think this is, girl? Last night she and I worked on that thing for a couple of hours. She LET me help her. 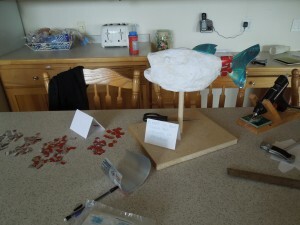 I did a lot of cutting and even helped with the gluing of the scales. When you hot glue on aluminum, the whole thing heats up very quickly, and we had some burned fingers. I think she’s been working on this one for two weeks. 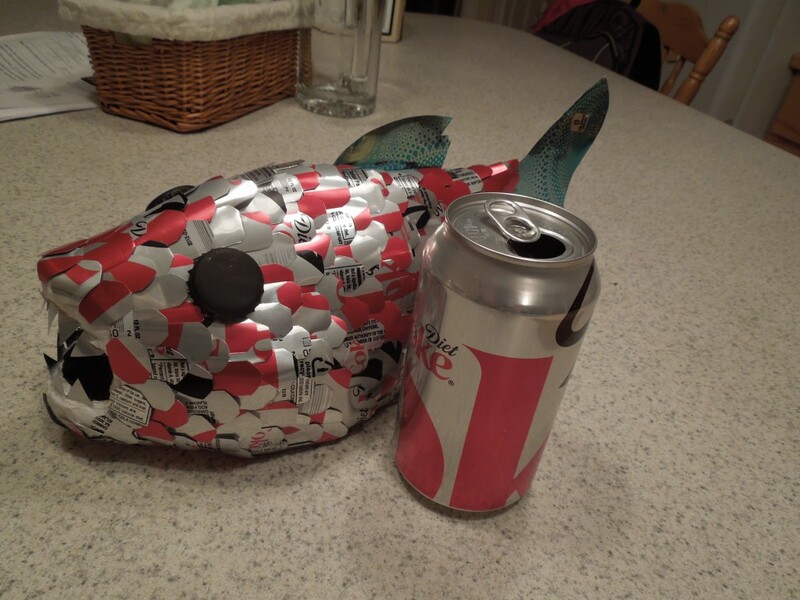 I lose track of time, but I do know the fish and cans and pieces of cans have been on my counter since Monday. Now that it’s done I think it looks REALLY cool. Like she should win some kind of award cool. 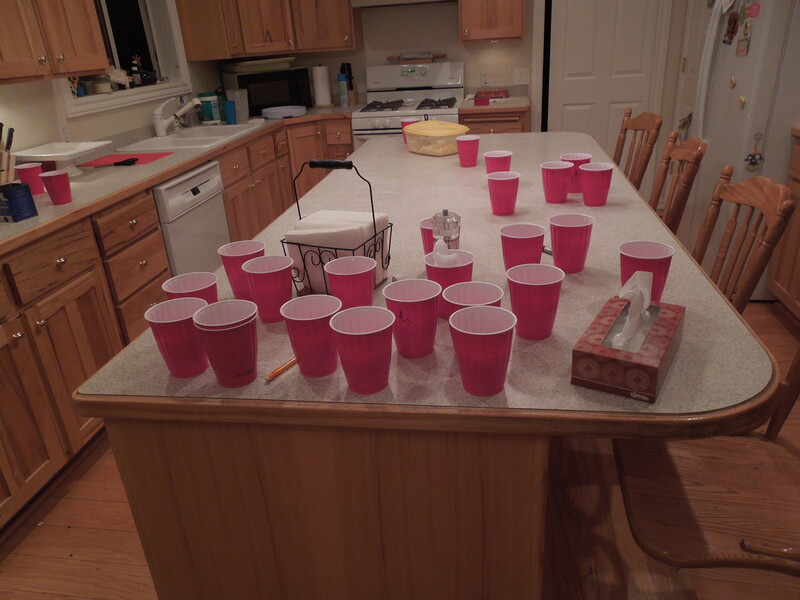 And now I’m going to go clean off the rest of my counter. It will probably stay that way for all of about five minutes before I haul up the pears and decide what I’m going to do with pears today. Decided to rent a bounce house or inflate a slide because that would be an easy activity for the boys, and I found a deal on KSL for a slide rental. 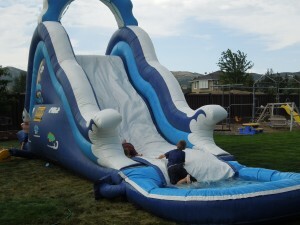 When the guy came to set it up, it was sunny and hot, and the kids were excited to give it a try. We started the party with just a few kids, since some of them had said they would be late or had to leave early because of football games and such. 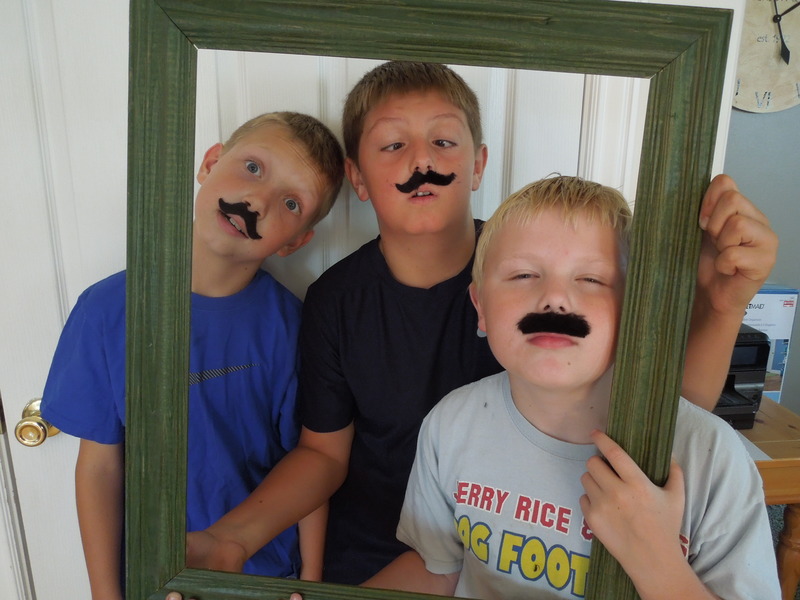 Since John wanted to have a “Mustache” party, we did the mustache things first. When we went outside to slide, it wasn’t quite as bright and sunny, and there were dark clouds off to the west. No worries, though. 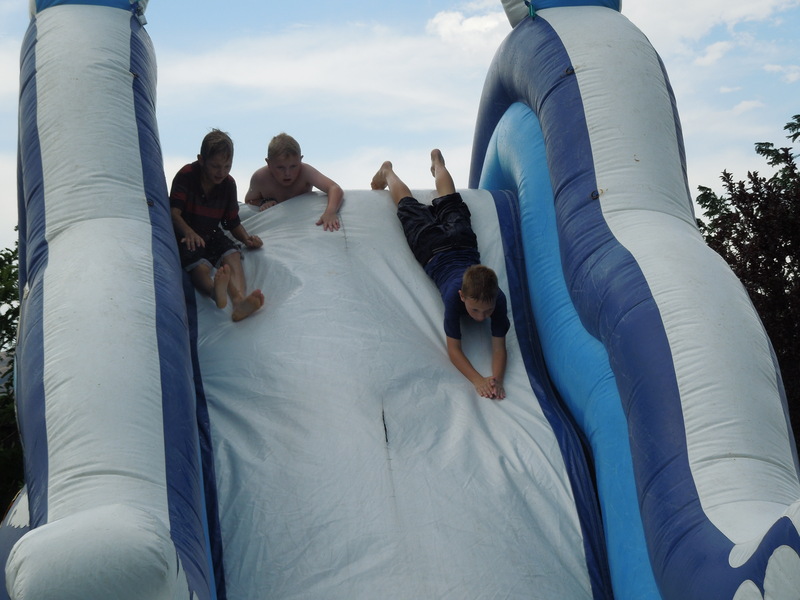 For we had boys and we had a slide and we had water. What could be more fun? There was lots of jumping and climbing and twisting and turning and splashing. Such fun. Soon the skies began to darken even more and we saw lightning a short distance away. Not wanting to have to explain to any of the mothers why we let her child be hit by lightning instead of bringing him back inside, we reluctantly made them get off the slide and come in. The wind was getting quite strong, and one boy was just shivering. I wasn’t cold, but then again, I wasn’t wet. 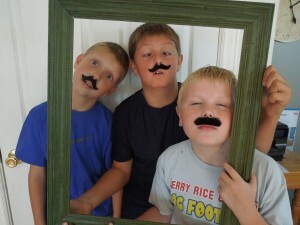 We ended the party inside, turning on the Three Amigos, and the kids dried off and were all happy. 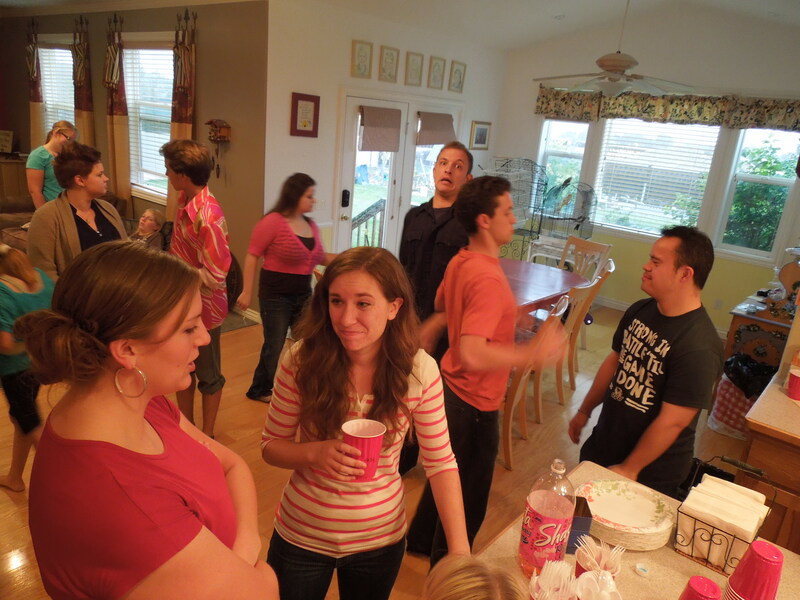 Party deemed a success, even though only half of the invited guests came and we only got about an hour of slide time in. I was a bit ticked off, because even with the deal, that slide had not been cheap, and I wanted to be using it ALL afternoon with the other kids and their friends. 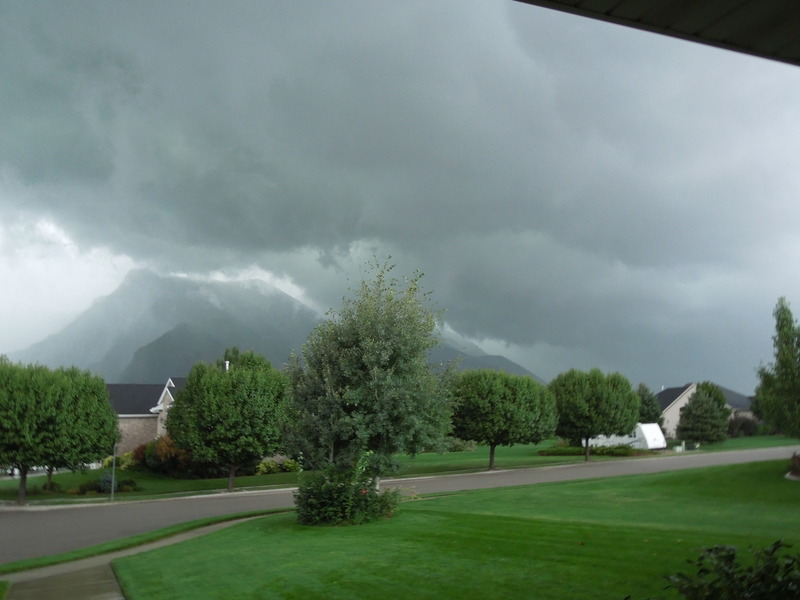 Even worse, DARK clouds soon covered the area, and I read online about areas in Alpine being evacuated due to flooding. Ugh. We had another party scheduled to start soon. I had invited the cast of Scarlet Pimpernel over for a backyard barbeque. Not much dry backyard after the rain started pouring. But I went online and reassured everyone in the group that the party could still happen, we would just have to move it inside. 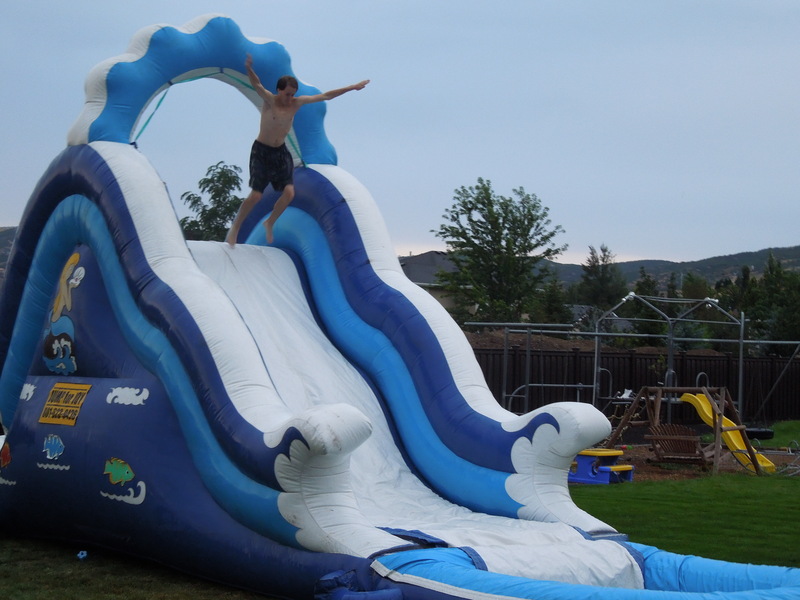 I had told them earlier about the large water slide, and to bring their suits, and one of the guys replied that he thought it would be fun to go down the slide, even in the rain. Ha. Well, even through the rain and wind, they came, and we ended up having a houseful of loud, funny, theater people. 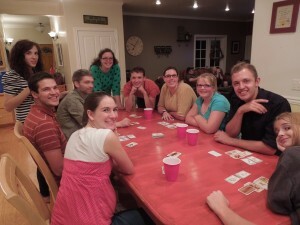 My family, not used to being around such a group, kind of cowered in the corner, but they warmed up eventually. Once the rain subsided a bit, we were able to get the meat on the grill, and eventually we had a prayer and ‘started’ dinner (even though everyone had already been eating all the chips and food that was on the counter already). 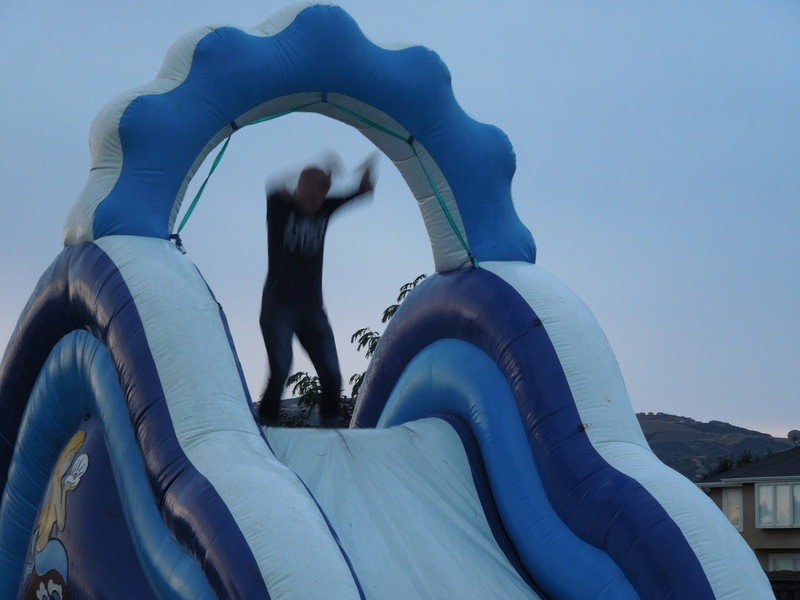 Soon, the rain was just a drizzle and I decided to plug that slide back in. Three of the guys ripped off their clothes to their swim suits underneath and jumped at the chance to go down that slide, even though it was kind of dark and kind of cold. I should have played around with my camera settings because it was hard to capture any good images with them moving so fast and it getting dark. But let me just say that there were some spectacular jumps. 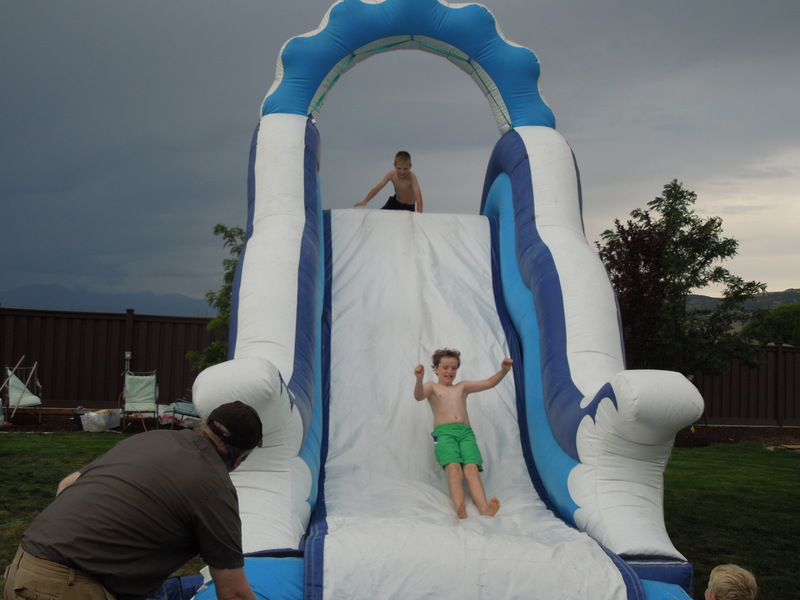 Even people who did NOT bring swim suits or a change of clothes had to try it out, and soon we had 10-15 people going down that slide. 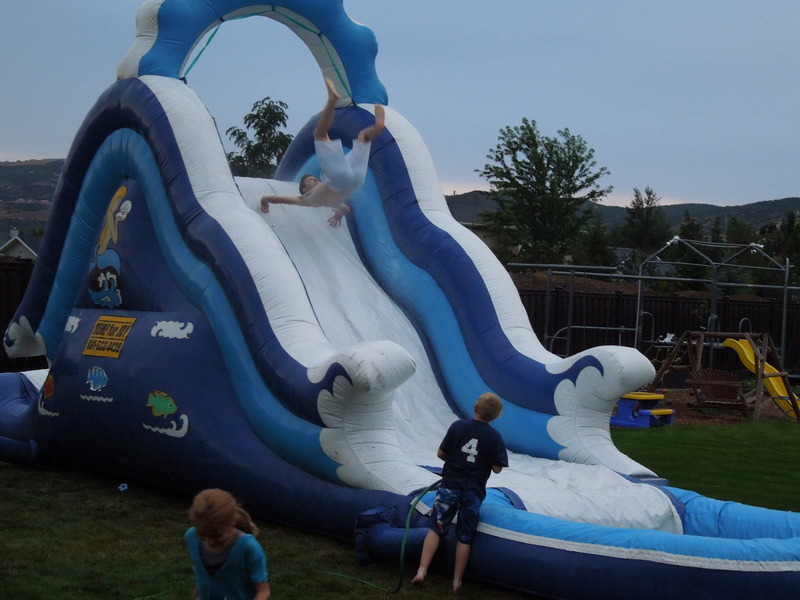 One of them was John, who got to do round two of his slide party, I guess. Eventually the wind kicked up again and it was just plain cold. And dark, so we deflated the slide and went inside to finish the party. It was really fun. Even after all the food was gone, people still stayed to play games, watch a movie, or just talk. We had a game of Settlers of Catan downstairs, Fooseball matches going on, and a big game of BANG upstairs. It really was fun. The day, even though it was not what I had planned and not the best weather conditions, was great. We managed to have LOTS of fun, rain or shine. I’m glad my Pimpernel friends braved the rain to come all the way out to Highland. When the show ended, I knew I would miss those friendships, and I told one of them that I just needed people to come to my house and entertain me, and that’s what they did. A year ago I had grand dreams. I was going to start a chime choir at the elementary school. Something unique, different, and wonderful. I was sure kids and parents would JUMP at the chance to enroll their children in such a great program, and I was sure that I would be able to get funding in the form of a grant to be able to buy a four octave set of chimes, maybe even a bigger set, for our school. How hard could it be, right? Dreams take time. 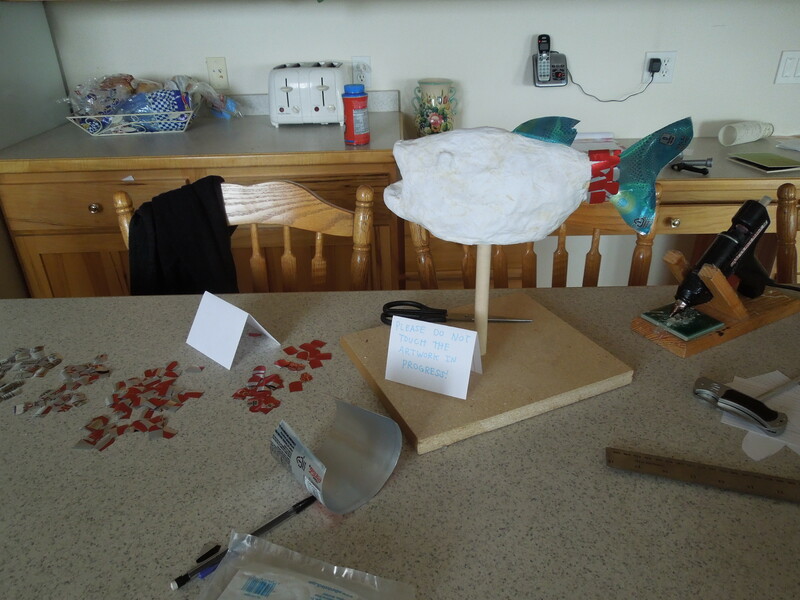 Yes, it seems like I’ve been working on this project forever, and it feels like it’s never going to get off the ground, but in reality, it’s only been since May that I’ve been trying to get this thing going. I have these chimes for a year, and hopefully by the end of this year, I can get funding to buy another set for next year. And hopefully I can get 20 kids interested enough in joining a chime choir that I can run this program. If I don’t? Well, maybe I can make it work with less kids. I don’t know. And you know what? I did it! It was hard. I really didn’t know how hard it was going to be. 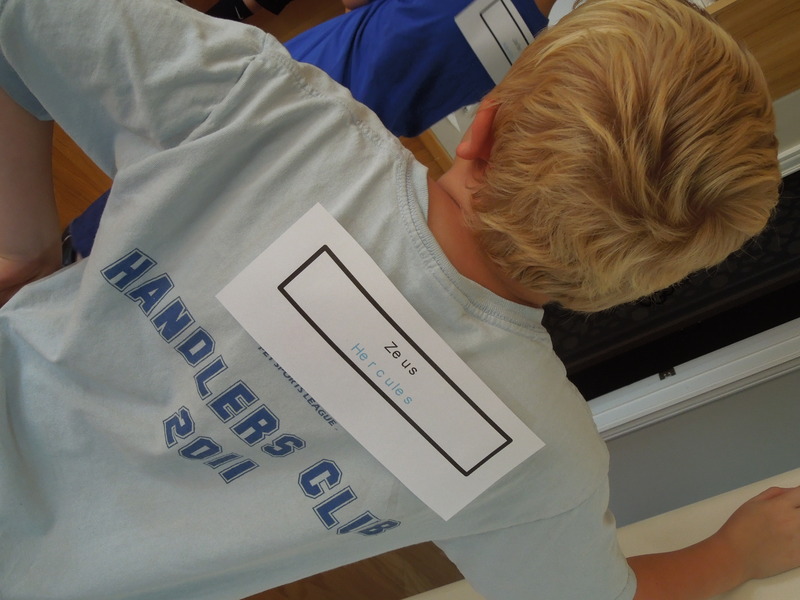 I had to do two different groups, one before school, and one after school. Together there were enough kids to play a song. Alone, they could play about 1/2 to 2/3 of a song. But we did it. And after Christmas, we even took the choir to two different locations to play, and I did my OWN fundraiser to raise the money to purchase a three octave set of chimes, even though more than one person told me it couldn’t be done. And at the end of the year, the principal told me that he appreciated all the work I had put into this, and offered to buy a fourth octave set for the school. He wants me to stay and teach, and not give up just because things are hard. This year, I have my own 3 Octave set of chimes, the school purchased the 4th Octave for us, and I already have 20 kids signed up! 20 kids was the requirement needed to PAY ME the whole year, so this year I should be able to be paid for all my time, not just half, like last year. I don’t get paid a ton, but it does work out to about $100 a week, which is better than nothing. I don’t know how it works, if there’s money left after they pay me, if I can use that to buy music or things. I hope so. So far any music or supplies I have bought have pretty much come out of that paycheck. But more importantly, with 10-14 kids in each group, they can play all the notes, so each group can learn and play a song, without being frustrated that it doesn’t sound right, and not knowing how the song is supposed to sound until we get all the kids together for a concert. I’m SO excited about that!! So, a big thank you to my friends who inspire me to keep trying, even when it’s hard. I wish I could take this lesson and apply it to every aspect of my life where things are hard. But silly me, I kind of have to learn the same lesson over and over again. Hi Ho, Guest Host Ryan here. Tonight I put on my headlamp, and went out to search for some peaches. I managed to find *2* peaches still on the tree. It’s officially the end of Peach Season here at the Erickson household. As Paige has already posted, it’s been our best Peach harvest *ever*, and we’ve managed to share them with quite a few people, as well as all the bottles Paige put up. We also have the start of a new season, with what we believe is the first of the eggs from the chickens we picked up earlier in the year. It’s quite a bit smaller than the regular layers’ eggs. Can you spot the new layers’ egg? Lastly, we have another start of a new ‘season’ in our family. The first of our kids’ generation got married last week. Congratulations, Camille!